Elk retain their sexually selected antlers for nearly half a year following their breeding season – perhaps wolves are the driving force behind why. Link to paper: Metz MC, Emlen DJ, Stahler DR, MacNulty DR, Smith DW, Hebblewhite M (2018). Predation shapes the evolutionary traits of cervid weapons. Nature Ecology and Evolution. Similar to a young child awaiting an occasion to open gifts, wildlife biologists in Yellowstone National Park, USA eagerly anticipate March 1st. Why? Because March 1st marks the beginning of the late winter portion of an annual study that is conducted by the Yellowstone Wolf Project. During this study, the primary goal is to detect wolf-killed prey (often an elk) through aerial and ground-based observations. 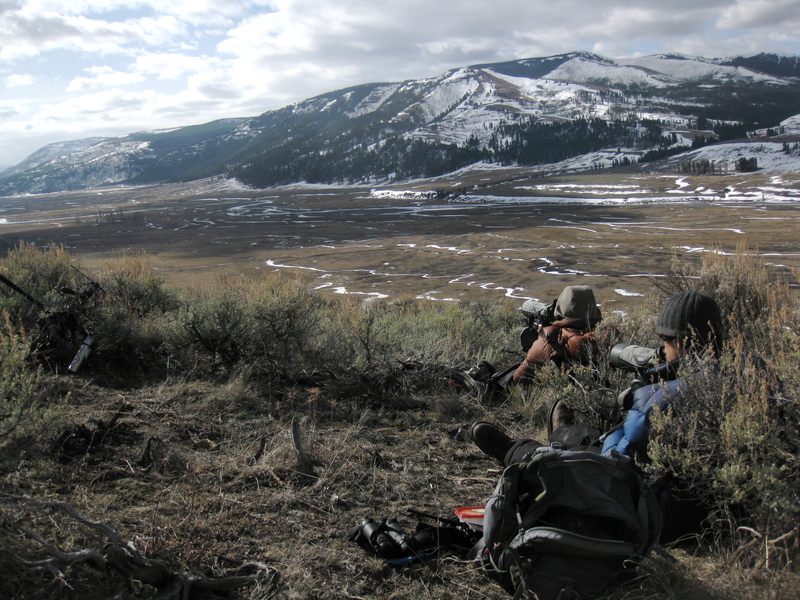 Today, I am a PhD student studying Wildlife Biology at the University of Montana, but I spent each March from 2002-2007 in the field observing wolves and their prey in Yellowstone. My daily assignment was to locate and observe the Leopold wolf pack, whose territory centered on a portion of northern Yellowstone with a particularly high concentration of bull elk. In early March 2005, an observation occurred that sparked the ideas that provide the foundation of our paper. Specifically, co-author Dan Stahler and myself independently detected a wolf kill (Dan from the airplane, myself from the ground). Three days later, the two of us hiked a few miles into the site to sample what remained of the wolf kill. Upon arriving, we found that the kill was a bull elk that had shed his antlers. This was surprising because we had not yet observed any antlerless individuals in the male elk population. The wolves had killed one of the first males to shed his antlers – no doubt this male was trying to get an early start on antler growth, thereby gaining an advantage on rival males during the following autumn’s rut. Starting antler growth earlier results in larger antlers, which leads to increased fighting ability and, thus, greater reproductive success. But our field observation suggested (and our paper that analyzed many observations ultimately showed) that there is a potential cost to being among these first males to shed their antlers – wolves, once ubiquitously spread across the northern hemisphere, preferentially kill antlerless males, despite their better relative nutritional condition. In our paper, we highlight that this increased cost (the risk of being killed by wolves) provides a likely explanation for why male elk retain their antlers for months longer than males of other antlered species living in North America. 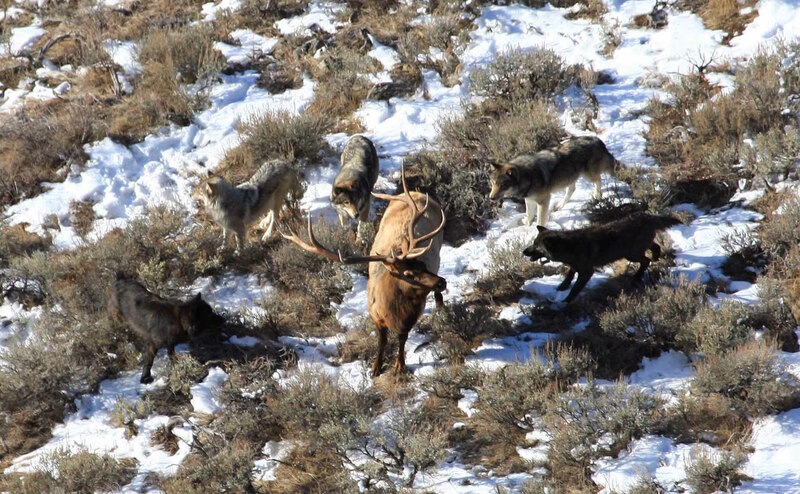 Elk are often the species that wolves target to kill – the medium-to-large size of elk make them an ideal prey for wolves. We suggest that selection acted strongly on elk, and resulted in an annual antler cycle where males retain their antlers throughout winter (well after the autumn rut) – thereby gaining the secondary benefit of predatory deterrence. The paper that we ultimately produced highlights how sexually selected antlers have a trait – retention time – that was influenced by another source of natural selection, predation. Antler traits were shaped by multiple selective pressures. Our paper was similarly shaped by the collaboration of scientists with differing expertise. Hopefully, our paper will encourage continued discoveries of how multiple forces shape the traits of species. POSTER ILLUSTRATION: EMILY HARRINGTON, MISSOULA, MT, USA. Are marine embryos ready to respond to climate change?